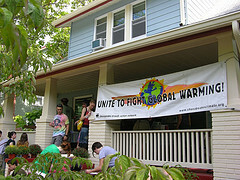 "Fighting Global Warming One House at a Time"
Mike Tidwell, Founder CCAN - My house sometimes produces more electricity than it needs. I have a roof of solar panels, a few dozen compact fluorescent light bulbs, one Energy Star Fridge, and a corn burning stove. But what's most interesting is how LITTLE it cost my family to retrofit our 1915-era house...and it's already paying for itself. Personal Action: Stopping global warming is going to take making changes in the way we live. Residential appliances, including heating and cooling equipment and water heaters, consume 90% of all energy used in the U.S. residential sector. You can help save the climate with your own two hands. Copyright © 2008, Chesapeake Climate Action Network, All Rights Reserved.